Rage Against the Machine drummer Brad Wilk has called for the group to reunite, admitting they are "amicable"
Rage Against the Machine's drummer has called for the band to reunite. 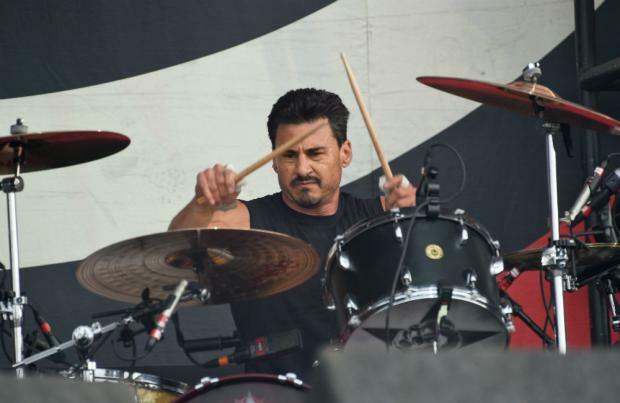 Brad Wilk has dropped a huge hint the heavy rockers - whose last album was 2000's 'Renegades' - could get back together, admitting the quartet, also made up of Zack de la Rocha, Tom Morello and Tim Commerford, are "amicable". He said: "Nothing would make me happier than to be able to f**k s**t up right now with Rage Against The Machine. "It's just really a matter of getting us all on the same page. "If that will happen again or not, I have no idea, but I know at least the four of us are amicable and can talk to each other, and actually even go hang out on occasion, so I think more we just want to be friends first more than anything. "How many bands are around more than five years? We've been around since 1991." Brad admitted frontman Zack is "working on music constantly", but insisted the 'Killing in the Name' group haven't reunited because there's "always something" stopping them. Speaking on the 'Let There Be Talk' podcast, he added: "It's always been something different. It's always been somebody different. It's always something. "For us, it's kind of like the magnet theory. One magnet is always being pushed out. You've just got to get all of the magnets to stick together for a minute, and that's always been our problem. "I feel like a politician right now because I'm kind of skipping specifics, but that's just kind of the best way I can answer it." Rage first came to prominence with their debut self-titled album in 1992 and went on to drop another three records, 'Evil Empire' in 1996, 'The Battle of Los Angeles' in 1999, and 2000's 'Renegades'. The group went on hiatus in 2000 and Tom, Tim and Brad formed rock supergroup Audioslave with singer Chris Cornell, who sadly passed away last year aged 52. The Rage trio also joined forces with B-Real, DJ Lord and Chuck D to form rap rock supergroup Prophets of Rage in 2016.